First World Problem: Does Complaining about the Service Make Me a Bourgeois Capitalist Pig? Big news. Apparently it’s now customary in the United States to receive your salad WITH you entrée. I learned this on Saturday night at the Good Earth in Edina, Minnesota, when my entrée arrived shortly before my salad. Before my drink had been served. And also before my husband’s soup or entrée had been served. I complained. I told the waiter I wanted to eat my salad before my entrée. So several confused waiters took away the entrée, and finally served my husband his soup. The original waiter came out to apologize. Sort of. You see, he explained to me, MOST people want their salad and entrée to come out at the same time. This lame and patently wrong excuse made me irate, and told him this was ridiculous (which prompted my seven-year-old daughter to nudge me repeatedly because Mommy was being mean to the waiter). 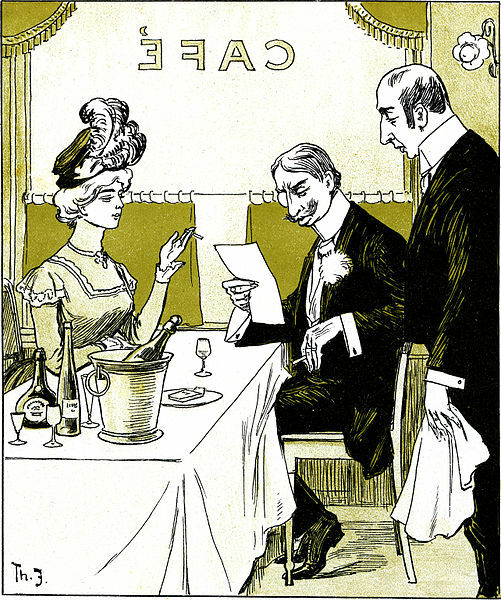 And yet, the waiter stuck to his claim that the first and second course customarily arrive simultaneously. So now you know. Next time you go to a restaurant—whether it’s Denny’s or something with a Michelin star—expect to be served your starter course at the same time as your entrée. Clearly this restaurant was having problems expediting their food, and clearly my waiter was full of it. I had a legitimate complaint. But whenever I complain about bad service—and there seems to be plenty of bad service these days—I find myself feeling guilty.